The City Opera House is one of six historically intact Victorian Opera Houses in Michigan. The primary objective of the City Opera House, over the last 29 years, has been the restoration of this unique public environment. 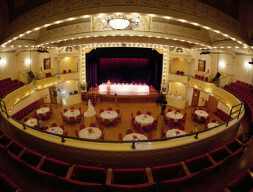 With its historic ambiance the theater offers to the northwest region of Michigan an exciting, one-of-a-kind venue for national, international, local and regional entertainment and arts opportunities, educational programming, and public and private celebrations.